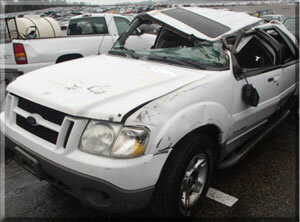 Over the last 20+ years, thousands of Americans have been involved in Ford Explorer rollover accidents. In many of these rollovers, the driver was confronted with a tire defect or failure or even an animal or object in the roadway. Sudden emergency situations like these test the driver's skill is tested to the extreme. In hard braking or steering maneuvers, many SUV's like the Ford Explorer often do not react to the abrupt movements and start to go out of control. Many Explorers especially during summer months, when fully loaded and luggage racks in use as well, this overloading can make a difficult vehicle to control even worse. When an Explorer or any SUV or light truck starts to go out of control, the vehicle may start to move perpendicular to the direction of travel and the vehicle starts to yaw and slide sideways out of control. When this yawing starts, it is hard to stop. Next the tires can deflate and the rims dig into the pavement, hit a curb or the grass or dirt on the shoulder or median. This is the start of the launching and rollover. The results of a highway speed rollover can be catastrophic and deadly to all. In many rollover accidents, other defects come into play. Besides a defective tire that may have started the accident, the door locks or latches often fail to hold and the door opens during the rollover, the roof pillar or column collapses under the pressure and often defective airbags don't deploy. In some rollovers the cause may not be a defective tire, but a defective power steering. In fact thousands of Ford Explorers (2011-2013 models) were recalled due to power steering defects and other 2011-2012 Ford Explorer were recalled due to possible defects in steering gear. As stated before a sudden tire failure can cause the vehicle to lose control especially when the tire blowout or tire tread separation is on the back tire. The Ford Explorer and Firestone Tire Lawsuits due to tread failures causing rollovers were all over the news 20+ years ago and most drivers think that the problem has been fixed. What the motoring public doesn't know is that an Explorers like any SUV can rollover under the right circumstances due to the inherent defect with most SUV's having a narrow track width and short wheel base which adds to a higher center of gravity making it hard to steer in an emergency. If you or a loved one was injured in such a rollover accident, airbag defect, tire failure or injured due to the collapsing roof, call the Willis Law Firm and get an SUV - Explorer rollover lawyer on your case. Willis is a Board Certified Personal Injury Trial Lawyer since 1988. The Willis Firm has been at the forefront to make our roads safer by filing lawsuits against the makers of these SUVs and pushing for answers. In the famous Jackson vs. Ford & Firestone, many important documents were revealed that helped to bring the rollover & tire problems to the American public. In fact firm founder Attorney David Willis later was given the prestigious Steven J. Sharp Public Service Award by the Association of Trial Lawyers of America -- now known as the American Association for Justice -- for his work leading to the largest tire recall in U.S. history and alerting millions of Americans of the dangers of Explorer rollovers. If such an Explorer rollover accident has impacted your family, notify a law firm whose founder is nationally known for tackling Explorer cases -- and winning. Contact the Willis Law Firm today. We'll provide you with a free legal consultation, help find and preserve the vehicle for evidence and start to prepare your rollover, roof crush, air bag or tire defect case for trial. Talk to a lawyer with 30+ years of rollover experience. Call 1-800-883-9858 or fill out this online form to contact a rollover lawyer today.